The Crested Butte Titans hockey team knew what they were getting into when they headed to Pueblo last weekend for two games against the Pueblo County Hornets. The Hornets are fast, physical and leave little room for mistakes. 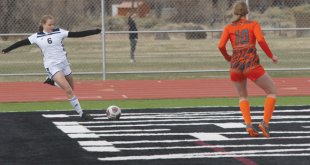 In the end, the Titans learned that first-hand as they slipped out of their game plan on several occasions, allowing Pueblo County to come back, to finish the weekend with a 3-3 tie and a 5-4 overtime loss. The Titans opened the two-game road stretch the same way they had been the past couple of games, flying and executing Watson’s game plan to build a 2-0 lead in the first period off goals from Dominic Piccaro. “We came out flying and ready to go,” says Watson. Then inconsistency struck as the Titans stopped doing what they were instructed and Pueblo County managed to climb back into the game, tying it in the second period and then taking a 3-2 lead early in the third period. “We got out of our systems and started trying to do it ourselves to let them back in the game,” says Watson. The Titans recovered to convert on a power play goal from Joseph Stock but neither team managed to score in overtime, leaving the teams with a 3-3 draw. Goalie Shaughn Rourke finished the game with 30 saves. Heading into the second showdown, Watson adjusted the game plan slightly but made a point to emphasize to his players to keep their heads and come out hard. Pueblo County struck first late in the first period but Piccaro and Jakub Kozanyi each scored within a minute to close the period on top 2-1. Pueblo struck back early in the second period to tie the game 2-2 but another two-goal burst from the Titans with Stock netting his second goal of the weekend and Graham Barrett scoring on a powerplay had the Titans back on top 4-3. But Titan penalties led to three powerplay goals by Pueblo over the course of the third period and in overtime, leaving the Titans with a 5-4 loss. Rourke finished that game with a total of 29 saves. 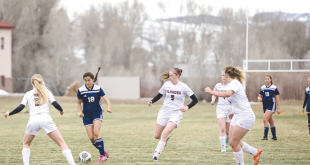 Crested Butte returns home this weekend to host Columbine on Friday, January 19 at 5:30 p.m. and then Glenwood on Saturday, January 19 at high noon.